Beneath the bay kitchen window, of my childhood home, there was a patch of Lily of the Valley. Lush green leaves covered the ground and every spring their white bell-shaped flowers grew up on tiny stalks. 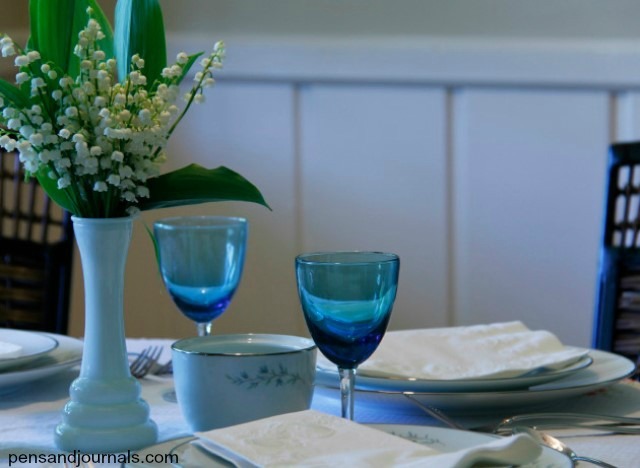 Once our windows opened up, gentle breezes wafted their fragrance around our kitchen table. All of our meals were surrounded by their sweet scent. Playing in the front yard or just walking past the flowers I would catch a pleasant whiff. Often I’d kneel down next to the lily garden and look closely at each white bloom. I adored them. Throughout their growing season, a small vase in our home held a bouquet. 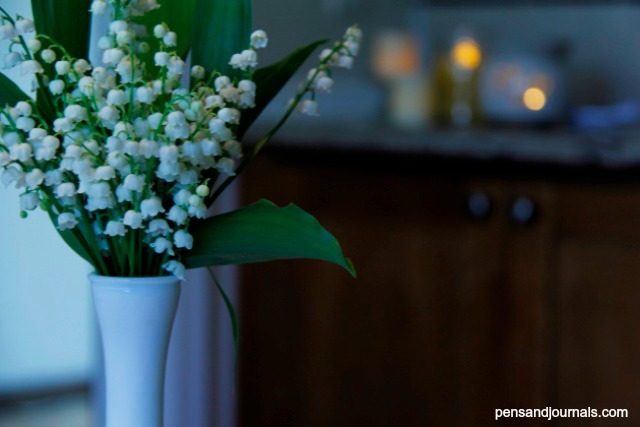 Today, I’m still in love with the tiny beauties called Lily of the Valley. Along the hillside in my yard they bloom. Like a cover blanketing the earth. Each spring I wait in expectation for their arrival. I weed and rake and glance toward them while taking care of other plantings in my yard. First the green emerges and in no time the delicate small flowers with their bold fragrance appears. The hillside is an ideal place for them. There they are free to run wild weaving in and out of the trees and bushes. At their first appearance, I’m ready with my shears. I clip a handful and place them in a vase. There isn’t a scented candle or potpourri that could compare to the fragrance that fills my home from one small bouquet of Lilies. There isn’t a centerpiece that compares to the elegance it brings to my kitchen table. On a beautiful spring day this year, I gathered a bunch for a bouquet and placed them in a vase. Then I went to my linen closet and pulled out an embroidered tablecloth that I recently purchased at a second-hand store. I draped it over the table placing the vase of flowers in the center. Instead of my everyday dishes, I pulled out a few pieces of china and stemware from a cabinet. On special occasions, like Thanksgiving and Christmas, my china and stemware have graced my table. In recent years, it hasn’t been pulled out much–not even for holidays. These days everything has gotten casual–even special occasions. But that particular day was different. My lilies were encouraging me to make a table transformation. My husband, tired from laying hardwood floors in our living room all day, walked into the kitchen and announced that he was going to shower before dinner. He glanced at the table and then at me with a puzzled look. I smiled. He smiled and walked toward the bathroom. My unpretentious breakfast nook transformed into something elegant after placing the vase of lily of the valley in the middle of the table surrounded by china. I reveled in the beauty. Why couldn’t we eat our leftover pulled pork on china, I thought. And so we did. After cleaning up the kitchen and putting the dishes away, one thing remained…the scent from the lilies. It remained throughout most of the house for several days. In the midst of the often messy circumstances in life there’s still beauty around us. Sometimes we have to look for it, be aware of it but it is there mingled with the messy. Sometimes it’s refreshing to create beauty. Just like our creator beautifies us. I was pretty messy when he came after me. He’s far from done with me but I’m a cleaned up version of what I once was. If Jesus is at the center of our lives, like my lilies graced the center of my ordinary table, he will make something beautiful out of our ordinary lives. Paul writes that followers of Jesus are the fragrance of Christ that spreads everywhere and an aroma of Christ to God. (2 Corinthians 2:14-15). When I think of fragrance, I think of a beautiful scent. To those God is seeking it will be irresistible but to others…maybe not so much. There’s no way around that fact. The fact is not everyone will appreciate the fragrance. 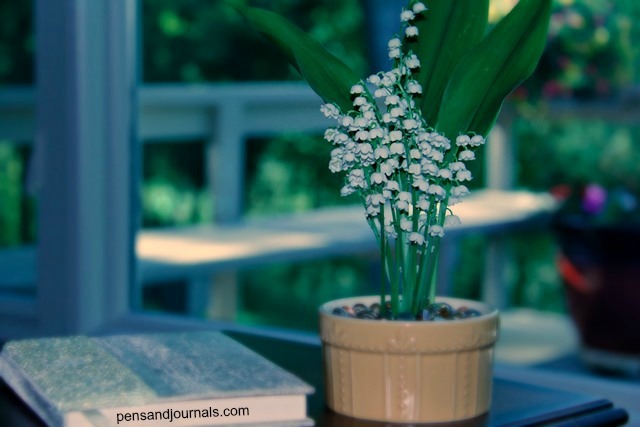 The fragrance emanating from the lily of the valley that filled my home for several days was a good reminder of what God has done for me and what the very essence of my life should be for him.